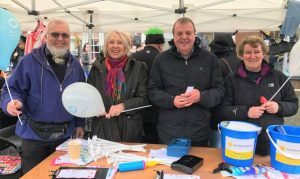 Support Groups are networks of local people who work together to fundraise for the Hospice through organising bake sales, coffee mornings, distributing collection boxes – the ideas are endless! The group can consist of two people or one hundred people and roles can vary within the group, such as Chair, Treasurer, Secretary and Volunteers. You will be supported every step of the way by your contact at the Hospice and is a great way of getting involved in the local community, meet new friends and learn new hobbies. If you would like to set up a support group in your area, we would love to hear from you! We also have supporters that are part of a Quiz Team and a Hospice choir, Claritas. Please come along to one of our meetings if you would like to know more.